Selecting the right road trip music is part of the fun of planning your journey. Depending on how much you love music, you may find yourself looking forward to the songs you'll listen to as much as the sights you expect to see. That's not unusual. For many of us, a long car trip is one of the few chances we'll get to listen to disc after disc without the interruptions of work, phone calls, and family responsibilities. Think of your road trip as a concert in your car. Of course, not all music is equally suited to the car. Some albums are too loud and distracting to be good driving music. Heavy metal, for example, often stays at a volume and intensity that would require too much of your attention on the road, especially if you're driving in traffic. Other types of music have too many dynamic contrasts and will force you to adjust your stereo volume constantly—creating a hazard. We love classical music, but some pieces have lots of quiet passages that become inaudible in a typical car on the highway. Do you just miss these melodies and wait for the next loud part? Or do you keep adjusting the dial so that you can enjoy the whole piece? I've tried both approaches and hate them both. And then there's the issue of car stereos. Which are the best models? Where can you find the best bargains? 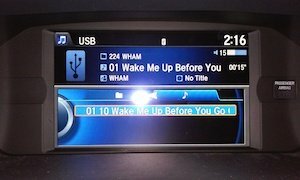 What's the best way to bring your digital music collection with you on your road trip and hook it into your car stereo? When it comes to tunes for the car, everyone has an opinion. We hope our thoughts on road trip music are helpful to you. Best driving music. Here are some thoughts about the genres of music that we believe are best suited to the car stereo. Best road trip songs. If you like listening to songs that are specifically about drivin', journeyin', and hittin' the open road, check out this list. Buy a car stereo online. You can save a bundle by buying just about anything online nowadays - but there's the issue that you can't ear-test a car stereo that you buy online. Here's how to get around that challenge. Read these pages, and then start burning CDs or loading up your iPod for your next road trip.